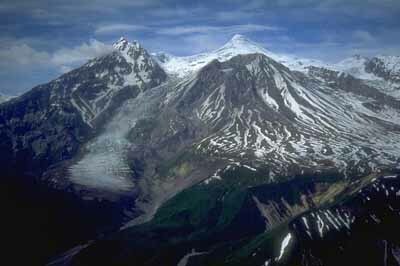 Mt Spurr is a stratovolcano located west of Anchorage, Alaska. It is the highest peak in the Aleutian Arc. The volcano was named for the explorer Josiah Spurr who worked for the USGS. Mount Spurr is a lava dome that sits inside a caldera three miles wide. The original summit of the mountain was destroyed by a debris avalanche and pyroclastic flows. Some of the blocks carried down the mountain in a debris avalanche were over 300 feet in diameter. They traveled over 15 miles away from the summit before being deposited at the base of the volcano. Today several lava domes sit in the caldera besides Mount Spurr. Mount Spurr is the tallest of the peaks in the area. It is 11,070 feet above sea level. It is also the summit peak on the mountain. The peak and its neighbors are constantly being monitored by geologists. They are a major threat to airliners if they suddenly erupted without warning and a jet plane flew through an ash cloud. Mt Spurr Find out more about Mt Spurr which is the tallest peak in the Aleutian Volcanic Arc.